For nineteen years, twin brothers Sheft and Teller grow up leagues apart from each other, yet feel the same distant call. Separated at birth for their own protection, they don’t remember the twin they are connected to, yet each bears in their hearts the same wounds and on their backs the same scars. too close, Sheft and Teller believe they must never allow themselves to fall in love. Coin of Rulve [ruhl-vay] is an arc of three powerful literarynovels that build into a climactic fourth. Told against the plots of the powerful and the providence of the Creator, Coin weaves several themes not always associated with fantasy: the tough journey toward self-acceptance, the link between heroism and compassion, and the community’s role in wounding or healing the ones born to save it. Who might enjoy reading Coin? How is it different from other fantasy novels? For the answers, click on the "Interview"page. 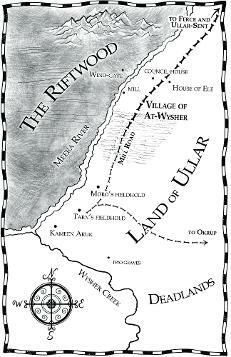 The story takes place in the isolated village of At-Wysher in the Land of Ullar, southeast of the Meera River. Sheft can't bring himself to tell his beloved Mariat the truth about his cursed blood. Nor can he share with her a sudden, devastating revelation about who he is and the dangerous journey that awaits him. But when he is forced to take part in the secret, blood-letting Rites of the Dark Circle, he confronts the true magnitude of the evil arrayed against him. It threatens to strip away all he has, but will first break his heart. 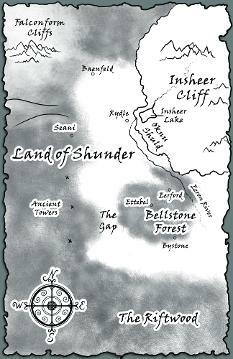 This novel is set in the Land of Shunder, across the Meera River and northwest of Ullar. Snatched as an innocent boy into the Spider-king's subterranean stronghold, Teller endures mind-probes that twist his memories of home. He grows up as the dark rebel, simmering with hatred for the family he thinks abandoned him. But when he discovers within himself the legendary power of fire, the beautiful slave Liasit ignites the memory of a twin brother---and a long-forgotten call. 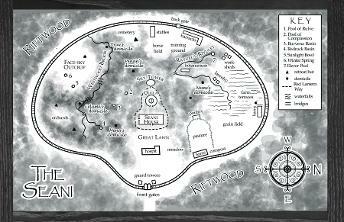 Surrounded by the ancient Riftwood, the Seani is the small hillside community in which Sheft and Teller were born. It lies directly across the Eeron Valley from Oknu Shuld, the Spider-king's formidable underground fortress. Sheft and Teller are the only ones able to challenge the Spider-king’s rising malice, but a deadly poison has left them with only thirteen hours to live. Meanwhile, Mariat must outwit the boar-men who have captured her, and then faces the most wrenching decision of her life.